TrustID supports a wide range of devices. Photographs can be added using webcams, scanners and Canon digital cameras. Signature capture is available on most editions, and automatic face recognition is available on Pro licenses. Pro Smart editions include biometric capture, storage and verification. 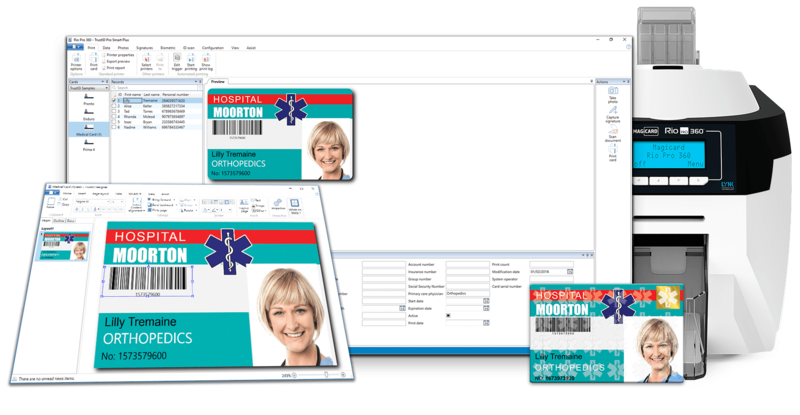 Although optimised for Magicard ID card printers, it is important to note that TrustID allows you to print to ANY Windows supported printer. It doesn’t matter if you want to produce ID badges or even print labels, if the printer has a Windows printer driver, you can print to it! Below is a list of currently support cameras. Our software supports webcams or any other camera that supports DirectShow. In addition we support TWAIN and any of Canon camera models we list below. Below is a list of our currently supported signature pads. TrustID has selected a few of the most popular brands on the market. Below you can find a list of currently supported contactless encoders. Most printer manufacturers will give you options of what encoders they support. If you have already selected a printer that has an encoder we do not list below, it doesn’t mean we cannot provide the solution you need. Contact our Professional Development Services team for help. Simplify data record entry, and ensure accuracy, by using our scanning feature. TrustID can scan an ID, store the image, automatically capture data via OCR and input data into a record. Enhance your security by using the physical characteristics of a person for authentication. TrustID has the ability to scan a biometric fingerprint image and store it anywhere you would like in your connected database(s). The four click user interface makes day-to-day operation simple. In just a few clicks you can find a record, enter/edit/delete data, take a photo and print a card.